Ödön Lechner (1845 – 1914) is an outstanding Hungarian architect at the turn of the 19th century. He became known for his splendid, richly decorated facades. After finishing his studies in Budapest, Lechner set out to study in Berlin at the Academy of Architecture (1866-1869). When he returned to Hungary, Lechner and his friend, the architect Gyula Pártos, founded an architecture office in Budapest. During his early career, Lechner got into contact with different architectural theories and styles. At the 1878 World’s Fair Lechner had the opportunity to study the forms and motives of Indian architecture. From his second journey to England in 1889 Lechner brought home his affinity towards eastern ceramic techniques and light steel construction (see: Thonet house in Váci Street, Budapest 1889). Lechner’s style is characterised by the combination of eastern and western influences. Moreover, he indulged himself in the ornaments and motifs of Hungarian folk art. Stylised citations of the colourful embroideries of herdsmen costumes are to be found on almost all of his buildings. A source of constant inspiration sprang from his acquaintance to the Hungarian ceramist Vilmos Zsolnay. 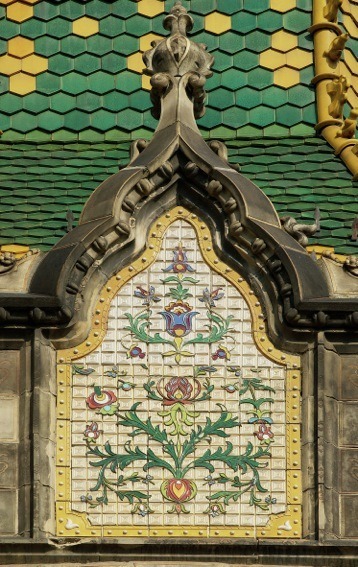 Lechner made use of ceramic and terracotta tiles produced in the Zsolnay factory in Pécs. In this way he not only avoided environmental damage and industrial pollution but also gave his buildings a unique recognition value. The emerald green cupola of the Museum of Applied Arts for instance can already be seen from afar. The Geological Institute (1896-1899) and the Postal Savings Bank (1899-1902) in Budapest as well as the Blue Church in Bratislava (1907-1913) rank among his most famous buildings. In 1911 Lechner was awarded the gold medal for his life work at the National Architecture Exhibition in Rome. 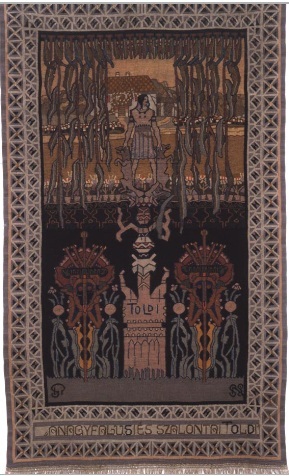 The Gödöllő Colony of Artists was founded in 1901 by Aladár Körösfői-Kriesch (1863 – 1920) who settled down in Gödöllő, a town situated about 30 kilometres northeast from the outskirts of Budapest. Its most prominent members were Sándor Nagy (1869 – 1950), Ede Toroczkai-Wigand (1869 – 1940), Miksa Róth (1865 – 1944) and Mariska Undi (1877 – 1959). The unity of art and life was top priority in the strict daily work schedule of artists and students. The Gödöllő Colony was influenced not only by the Arts and Crafts Movement but also by the premises of the Darmstadt Colony. Moreover, Hungarian folk art traditions played a significant role. Teachers and students set out for research trips to Transylvania. Furthermore, themes and motives from ancient Hungarian legends, ballads and folk tales were used as a source of inspiration. Members of the Gödöllő Colony organised inter alia weaving and glass workshops for students where they acquired traditional crafts and took part in the creation of a Gesamtkunstwerk. The National Salon in Budapest (1906 – 1907, still ruined), the Source of Arts fresco in the Music Academy (1907) and the Cultural Palace of Marosvásárhely (Târgu Mureş Romania, 1911-1913) rank among the most outstanding Hungarian Art Nouveau buildings. The Zsolnay Porcelánmanufaktúra Zrt/ Zsolnay Porcelain Manufactory was founded in 1853 by Miklós Zsolnay (1800 – 1880) in Pécs, Hungary. His son Vilmos (1828 – 1900) joined the company and as its director bestowed the family enterprise with worldwide success. The innovative products of the Zsolnay factory gained recognition at international exhibitions and world’s fairs. The first success for the family enterprise was a gold medal for a special porcelain faïence on the 1878 World’s Fair in Paris. 15 years later the Zsolnay company lanced a unique, frost-resistant ceramic called “pyrogranite”. 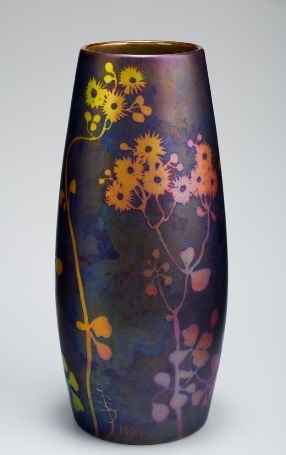 When in the 1890’s the eosin technique was introduced by Vilmos Zsolnay the starting signal for the production of splendid iridescent Art Nouveau pieces was given. Company artists, such as Sándor Apáti Abt (1870 – 1916), Lajos Mack (1876 – 1963), Géza Nikelszky (1877 – 1966), and József Rippl-Rónai (1861 – 1927) as well as family members of the Zsolnay clan - Tádé Sikorski (1852 – 1940) and his wife Júlia Zsolnay (1856 – 1950) made intensive us of this acquisition. Until the outbreak of the I. World War numerous delicate eosin ceramics were produced by the Zsolnay factory. Especially fascinating about the eosin glaze is its iridescent metallic quality. With the angle of reflection, colours change between shades of green, purple, red, blue and gold.